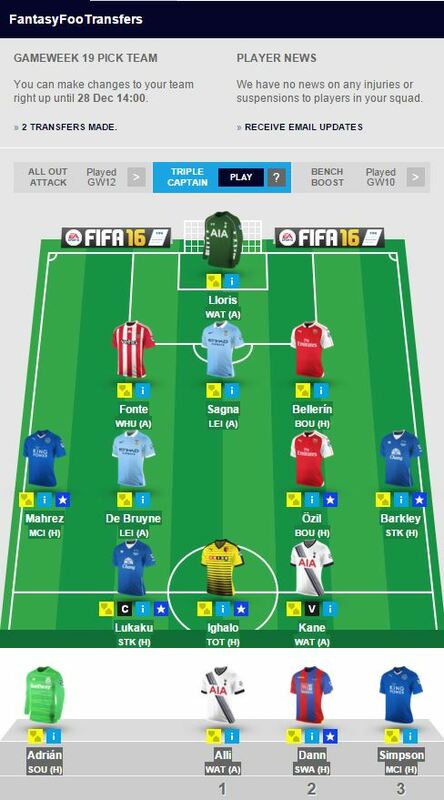 It is not very long until the last gameweek of 2015 and it is time for the last FFT fantasy squad article of this year. Past the halfway point as well, one cannot think and wonder how different this season has been so far. We saw Leicester City become table toppers while reigning champions Chelsea came perilously close to the drop zone. Meanwhile Jose got the sack as manager, Vardy broke a long standing record, Manchester United struggle to find their winning ways and Arsenal touted as potential winners. Strange season, I told you so. Nonetheless, all these events have contributed a sense of excitement and suspense to the competition, effectively making it an open contest. May the rest of the season be as exciting as it has been up until now! Our faith in Hugo Lloris (5.1) paid off well as Tottenham kept a clean-sheet with 3 crucial saves. Tottenham face new comers Watford on Monday, a fixture which could turn out to be really tricky for the North London side. Watford have had a good run of games recently, but they will have to come up with something special to break through the Tottenham defense. Which is why we retain the services of the Frenchman in goals for this week as well. The spare keeper remains the same as week – Adrian (5.0). Sometimes the defense is the best offence. Yes, this is probably the millionth time I’ve used that line, but I cannot help stress the importance of having quality defenders in your team, who can keep those clean sheets and earn vital points for your fantasy team. Hector Bellerin (5.9) had a hard day at office against Southampton but we should not lose hope in the talent that this player has. An amazing work rate allows him not just to defend but to also creep up the opposition wing and bomb the dangerous area with vicious crosses. Scott Dann (5.6) is a great choice for a defensive position, more so as Crystal palace come up against Swansea who are really struggling to stay out of the bottom three. Jose Fonte (5.3) is the third defender we choose in the playing 11 owing to a likely comeback to form and relatively easy fixtures for Southampton. Bacary Sagna (5.5) and Danny Simpson (4.1) remain our spare defenders as we retain them in the 15 but choose not to play them this week. Mesut Ozil (9.9) has been in the finest form of his time at Arsenal and it is showing in the games as well. The ‘Assist’ king had a forgettable game against Southampton and will be looking to put it all behind when Arsenal face Bourmouth at home. Kevin De Bruyne (10.8) announced his comeback to form with a goal and two assists against minnows Sunderland. However, they now face a much bigger challenge in Leicester city and it only remains to be seen how this game will turn out to be. Same goes for Riyadh Mahrez (7.1) who is in the form of his life right now and showed glimpses of magic in the game against Liverpool but was unfortunate not to get onto the scoring sheet. Bamidele Alli (5.3) is the fourth midfielder in our playing eleven, emphasizing our confidence in Tottenham’s fixture. Ross Barkley (7.5) is the fifth defender to make it to the squad this week. The selection of forwards has been relatively easy and consistent these last few weeks but things are changing this week. Harry Kane (9.7) and Romelu Lukaku (9.3) retain their places in the squad; however we have to finally let go of Jamie Vardy as the wonder kid seems to be struggling with fitness issues. It seems like a fair decision to replace Vardy with another goal scoring machine – Odion Ighalo (6.1). This entry was posted in Squad and tagged EPL, Fantasy Football, fantasy football squad, fantasy football tips, fantasy football transfers, fantasy premier league, FPL, Transfer Tips. Bookmark the permalink.